March 2011 – Concurrent Technologies introduces their latest high performance 2nd Generation Intel® Core™ processor board. The TP 86x/39x is a single slot air-cooled 3U CompactPCI Single Board Computer (SBC) utilizing the 2nd Generation Intel® Core™ microarchitecture, featuring integrated graphics and memory controller on a single 32nm process technology. The TP 86x/39x leverages exceptional CPU and graphical performance on the 3U CompactPCI form factor. With the choice of the Intel Core i7-2715QE processor, Intel Core i7-2655LE processor, Intel Core i7-2610UE processor or Intel Core i5-2515E processor and the enhanced features of the Intel Series 6 Express chipset, along with up to 8 Gbytes of DDR3-1333 ECC SDRAM. The TP 86x/39x is ideally suited for critical embedded applications particularly within the defense and transportation markets where low power, real-time, and data intensive features are all essential requirements of a small form factor computer. 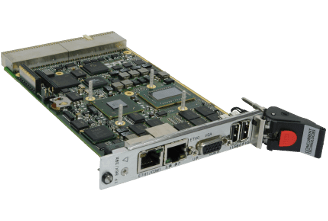 The TP 86x/39x SBC also features a 32-bit 33/66MHz PMC or an XMC x4 PCI Express® site along with a wide array of additional I/O; 2x USB 2.0, 2x SATA, 2x serial channels (RS232 and TTL), 1x Gigabit Ethernet port, 1x DisplayPort, and 64-bit PMC rear I/O. The front panel also features Gigabit Ethernet, serial port, 2x USB 2.0 and a VGA port; further I/O is supported with an optional second slot PMC/XMC board. The CompactPCI interface of the TP 86x/39x offers a system slot controller which provides an Intelligent Platform Management Interface (IPMI) for PICMG® 2.9 R1.0, support for up to 7 peripheral slots, full support for hot-swap capabilities and the ability to operate in satellite mode (CompactPCI interface disabled). Operating systems currently supported are Windows® 7, Windows® XP, Windows® Embedded Standard 7, Linux® and VxWorks®. Addressing today’s demanding applications from medical to military the TP 86x/39x SBC is designed to scale from commercial temperature grade 0°C to +55°C (N-Series) through to extended temperature grade -40°C to +85°C (K-Series).